There are dozens of Clubs at NoHo. These are just some of the ones popular with or led/founded by HGM students. Every year, new organizations are founded by students who want to share their interests with others. Beyond clubs, check out some of our TEAMS. The American Cancer Society (ACS) club is one of the largest and most active volunteer groups at the school. As a chapter of the ACS organization, the club assists in promoting a mission of "education, advocacy, and service." With a concentration on lung cancer, members participate in cigarette pick-ups at the local park and use these butts to bring awareness at events throughout the year. They conduct an interactive assembly for classrooms to emphasize the negatives of smoking and to draw attention to the prevalence and preventability of many cancers. Fundraising constitutes a large portion of the club's efforts, from the sale of handmade crafts to the two-month home room competition "Dime Wars." 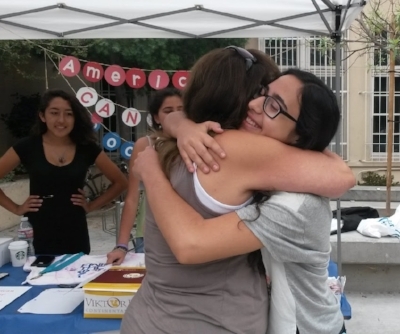 Students participate in a variety of events but most notably "Relay for Life," a 24-hour walkathon at Reed Middle School that unites hundreds of volunteers from the North Hollywood area. By following the three-fold mission, the ACS club has raised thousands of dollars and created greater awareness throughout the community since its inception, in 2007. The American Red Cross club is a group of youth volunteers that connect with the district Red Cross chapters to help accomplish the organization's mission of preventing and alleviating human suffering in the face of emergencies, by mobilizing the power of volunteers and the generosity of donors. We plan projects through which we can contribute to our local and global community, educate our community on how to prevent, prepare for. and respond to emergencies, hold fundraisers to provide relief to victims of disasters. and also partner with other organizations to achieve other service-related goals. Some of our major events throughout the year include the Measles Initiative, Fire Canvassing, puppet shows, CPR and First Aid trainings, Holiday Mail for Heroes, local walks, and the Rose Parade. With the right mentality, caring heart, and true effort. We all can work to save a life. ARC is a student-run group that attempts to raise both money and awareness for animal-friendly practices. With over three hundred dollars raised to date, Animal Rescue Club works primarily with Best Friends Los Angeles, an animal shelter group dedicated to making LA no-kill by 2025. With volunteer hours for every meeting and a potluck each month, Animal Rescue Club is a great environment to relax and chat, be it about hard-hitting topics such as the bias against pit bulls or simply how much your pet dog likes belly rubs. Volunteer options exist, although they are not mandatory and require a parent if a student is under 16. We meet in Mr McCollaum's room, R134, in Tuesdays at lunch, so feel free to stop by! Contact us at: NhhsARC@gmail.com. You can also talk to Franklin Bertellotti or Felix Bulwa at school. The Annual is the HGM's Yearbook; it's the HGM in a nutshell. A staff of sixteen HGM students works on the production. The staff tries its best to record the most memorable, defining, and picturesque moments of the school year. Every year, students apply for staff positions such as Class Editor, Class Photographer, Layout Editor, Candid Photographer, and General Assistant. The Annual contains no pre-designed templates and its sixty all-color pages, filled with candid shots, baby pictures, and event/club photos, are definitely entertaining for students, teachers, and parents to see and remember. With a different theme every year, The Annual is exciting and fresh. We are a club that promotes involvement in the aviation community. Club activities include discussions, visual presentations, guest speakers, and field trips. Volunteer organization focused on environmental issues. California Scholarship Federation is an opportunity for students to engage in volunteer work and be recognized for their contribution to the community. Each semester students may apply for membership and tum in a minimum of 15 volunteer hours to qualify for that term. When students have accumulated a total of 4 semesters of membership and hours. they are considered seal bearers and may apply for various scholarships offered. Students play Dungeons & Dragons, chess, and other board games in weekly meetings. The NHHS Classical Music Club is dedicated to enhancing local culture through the appreciation and performance of classical music. Club members regularly listen to works of classical music and discuss the history of the art form during the Baroque, Classical, Romantic, and Contemporary eras. Most discussions examine music’s relationship to significant historical events and artistic achievements, including the emergence of popular democracy during the nineteenth and twentieth centluries and the development of literary and artistic movements that mirror the subgenres of classical music. In addition, the Classical Music Club has organized student chamber music groups and concerts. CEJ is a club that strives to help improve the environment and the school. We want to help North Hollywood High School by creating recycling programs on the quad or finding ways to beautify the campus. We also try to educate our members about organizations that help the environment overall such as: SoCal 350, an organization that fights against fossil fuels and tries to bring the P.P.M of smog in the air below 350 (currently above 400 in the Los Angeles region); and the Sierra Club, a national organization that focuses on global warming and reduction of fossil fuels used in Los Angeles. We also strive to educate our members about our school system and how it can be improved. We are currently working with Schools LA Students Deserve (SLASD) and their movement to improve LAUSD. Create for a Cause is a club that allows students to use their individual talents to help children. By creating and selling handmade items and organizing fundraisers, we are able to raise funds to donate to Free Arts, a nonprofit organization that aims to use art as therapy for abused, homeless, and neglected children. Create for a Cause works in alliance with Free Arts for Children's Court, a specific program of Free Arts that aids children who are undergoing legal battles. However, our club isn't just limited to those who are artistically inclined; members also help in maintaining our website and organizing fundraisers. Description coming soon. We're busy... y'know... doing something. The North Hollywood High School Film Club is dedicated to the screening of classic and contemporary films of high quality, especially those produced before 1980. Club members have watched and studied silent-era comedies, including Buster Keaton’s The General, expressionist dramas such as The Cabinet of Doctor Caligari, and notable modem films such as Shattered Glass (2003), as well as a handful of avant-garde short films. North Hollywood High School’s Gay-Straight Alliance was created to be a safe and accepting space for all lesbian, gay, bisexual, transgender, questioning (LGBTQ) and straight students. The NHHS Gay-Straight Alliance was established to educate students about tolerance, awareness and activism. Along with spreading awareness within North Hollywood High School via assemblies and PA announcements, the NHHS GSA also works in the surrounding community. Members have volunteered at Project Chicken Soup‘s kitchen, donated goods to AIDS Project Los Angeles and raised $1,350 for AIDS Walk Los Angeles 2012. NHHS’s GSA meets every Friday at lunch in the room of Mrs. Ordoña, the club’s long-time sponsor. For further information, please contact nohogsa@gmal.com. The Jewish Student Union (JSU) is a club where Jewish education and morals are accessible to students of all backgrounds. It is a place where students can get new ideas, new friends, and a generous serving of Kosher pizza. Aside from a student body leadership, there is a JSU adviser present at meetings, who allows North Hollywood High School's JSU to expand its horizons and reach out to Jewish opportunities throughout the world. JSU opens the door for Jewish learning outside of school with programs ranging from in-depth Torah learning with a peer to large inter-school group discussions at a local coffee shop or restaurant. Calling all hopeful writers, philosophers, essayists, poets, satirists, and visual artists! The Magnitude is the Highly Gifted Magnet's student-run literary magazine and is the perfect opportunity for high schoolers to publish their creative endeavors and collaborate with other Magnet students to improve their work. At the end of every semester, we distribute roughly sixty pages of artistic exploration. With the support of our English department teachers Dr. Haut and Mrs. Ordoña, The Magnitude is a showcase of our students' love to create. Our current Editor-in-Chief can be contacted at themagnitude@gmail.com for more information. The Math Club organizes and competes in many math competitions through the year, including but not limited to, the American Mathematics Contest (AMC 10 and 12), Bay Math League, Math Day at the Beach, Caltech-Harvey Mudd Math Competition, and the Mandelbrot Competition. Meetings are held at lunch on Tuesdays in Ms. Espinosa's room, K223. All grades and math levels are welcome to come. Physics Club was created to give students who attend North Hollywood High School the opportunity to participate in physics and mathematics outside ofthe classroom. Our mission is to spread growth and leaming within the physical sciences. We hold meetings once a week, which usually include either lectures or discussion. We also offer tutoring services, and encourage students who have already demonstrated mastery of the AP course material to assist their peers. The North Hollywood High Slam Poetry Club consists of members that gather to create a comfortable and relaxed environment where teens can express themselves through slam poetry, or the art of Spoken Word/performance poetry. Meetings are held at lunch, during which members can discuss and share videos of slam poetry, as well as create and exchange their own slam poems. Future plans for this club include field trips to local slam poetry bars and coordinating with various community sen/ice clubs to perform wherever needed. The North Hollywood High Club welcomes anyone with open eyes, ears, and mind! Ultimate Frisbee is played during lunch on the football field nearly every day except Thursday, and is supervised by Mr. Maine, who also participates. The club is mainly HGM students, but other students join in as well. This activity gives students who otherwise participate in different clubs a chance to get to know each other better outside of an academic setting. Ultimate Frisbee is a fun sport that is growing in popularity around the world and is played in most colleges. It combines elements from Football, Soccer, and Basketball, which results in a fast-paced, competitive, but non-contact sport. It doesn't matter if you‘ve never thrown a Frisbee before or if you're a pro, everyone is welcome. Visual Arts & Music for Society (VAMS) is a club that is dedicated to connecting the love of art, music, and having fun to community service opportunities. We organize two main types of events, one being for underprivileged families in shelters, and the other for seniors. At shelters, we engage children in games, cookie decorating, arts and crafts, face painting, and performances; at senior homes, we do performance events. These performances include everything from vocal performances to yo-yo shows. Anyone is welcome to join VAMS regardless of artistic or musical talent. The more volunteers we have, the more we can serve our community!